In Victoria, livestock is mostly sold at saleyard auctions, paddock or over-the-hook sales. Duty must be paid with all methods of selling cattle, sheep, goats or pigs on a monthly per-head or carcass basis. Cattle includes bulls, cows, oxen, steer, heifers, bison and buffalo. If you are a vendor selling on your own behalf, you must pay duty via a statement directly to us. If you sell through an approved agent, they pay the duty to us but pass the cost on to you. Duty must be paid to us by the 21st of each month. If there is no liability for the month, a nil return must be lodged. 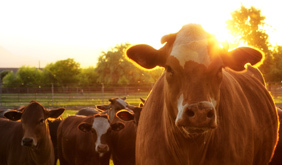 Duty is five cents ($0.05) for every $20 or part of $20 of the sale price for one head of cattle sold singly, or the total amount of the sale price for any number of cattle sold in one lot. The maximum duty for any one head of cattle (sold singly or as part of a lot) is $5. Each carcass weighing up to and including 250kg attracts duty of 90 cents ($0.90). Each carcass weighing more than 250kg attracts duty of $1.30. Duty is 15 cents ($0.15) a head. Duty is 12 cents ($0.12) for each sheep or goat, or each carcass of sheep or goat. Duty is two cents ($0.02) for every $5 or part of $5 of the sale price for one pig sold singly, or the total amount of the sale price for any number of pigs sold in one lot. The maximum duty for any one pig (sold singly or as part of a lot) is 16 cents ($0.16).